Liz Stephen destroyed the women’s field this weekend in the annual Climb to the Castle rollerski race. The margin, just over 5 minutes in a race that took the leaders between 40-45 minutes is certainly impressive. But I think that margin doesn’t provide much useful information. Time trials that are most useful as gauges of performance trends are the ones that have the most stable, repeatable conditions. I believe Climb to the Castle has everyone using identical roller skis (at least that’s my recollection) and that helps. But as noted in the coverage, road and weather conditions can pretty severely impact times. In that light, the fact that Stephen covered the course more than a minute faster than last year in worse conditions is certainly a more reliably good indicator. But even then, it’s sort of crucial to note how the race dynamics played out. Stephen skied alone basically the whole way this year. Last year, it sounded like she skied alone for over half the race. That will tend to make those efforts more similar to those produced by a interval start race, which are easier to compare, I think. For example, it’s hard to read much into the fact that Sargent skied around 2.5 minutes slower this time around, since once Stephen was off the front it’s easy for “group racing” mentalities to take over common in mass start events that slow the pace. Diggins was actually frequently faster than Stephen last season, and even then it was unusual for the margin between them to be more than 2.5% in either direction. 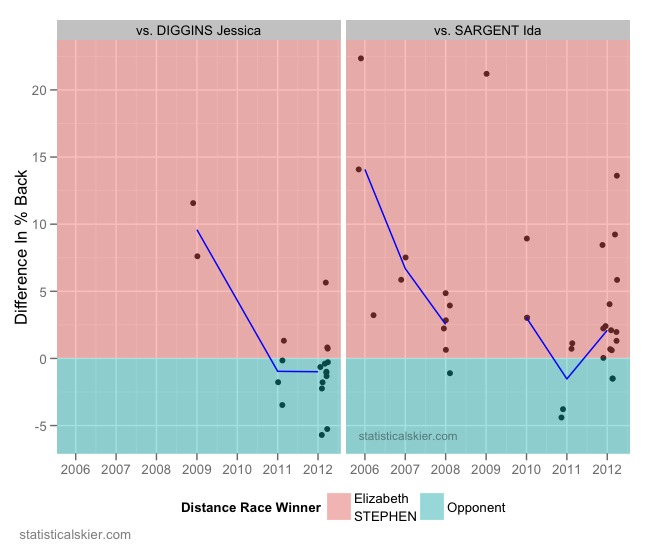 Even Sargent, who had somewhat of a rough season, was almost never more than 10% behind Stephen. As a data guy, I’d love to see Climb to the Castle run as an interval start race, which would somewhat improve it’s use as a benchmark, but you’d still have a hard time accounting for differences in weather, particularly wind. But obviously, that’s logistically more complicated. Posted by Joran on Tuesday, September 18, 2012, at 6:00 am. Filed under Analysis, Cross Country. Tagged climb to the castle, ida sargent, jessie diggins, liz stephen, pre season, roller skiing, time trial. Follow any responses to this post with its comments RSS feed. You can post a comment or trackback from your blog.